Leeds United let a lead slip as their run in the Carabao Cup came to an end in a fourth round tie at Premiership Leicester City. Pablo Hernandez gave United a first half lead, but the hosts were level by half-time following an error by recalled goalkeeper Felix Wiedwald and went on to clinch victory after the break. 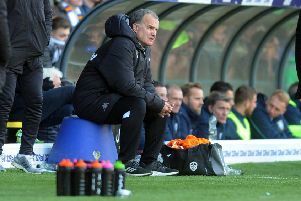 With a big game against Sheffield United in the league on Friday night, United boss Thomas Christiansen changed almost his entire team from the one that won at Bristol City on Saturday with only midfielder Kalvin Phillips keeping his place. Leicester also made a number of changes to their line-up, but still had a strong looking line-up, although they did not make a great start. It was comfortable for the Whites in the early stages and they had the first chance when Jay-Roy Grot played a nice one-two with Kemar Roofe, but saw his shot saved by home keeper Ben Hamer. Roofe had an effort saved before Leeds went ahead in the 27th minute when Pablo Hernandez beat Hamer with a fine curling shot form the edge of the box. But they were quickly pegged back as Leicester’s first real chance saw recalled keeper Felix Wiedwald punished for an error as Kelechi Iheanacho pounced on his weak clearance to make it 1-1. Suddenly the hosts looked more dangerous and they went close to taking the lead when Demarai Gray hit a low shot just wide from the edge of the box. Gray went even closer for Leicester just before half-time as his shot from 25 yards out thumped against the woodwork. Grot did hit a shot wide after a run at the home defence, but United were pleased to be level at the break after controlling things up to scoring. Leicester started the second half the stronger with Gray firing over when well placed then seeing a shot saved by Wiedwald. Andy King missed a great chance after being set up by Islam Slimani as he seized on a short back pass by Pontus Jansson only to send the ball wide of a gaping goal. Another sitter went begging for the hosts as Slimani headed over from close range when it looked easier to score. A brief respite saw Leeds get forward only for Hernandez to see his shot blocked. Leicester finally got the second goal they had threatened on 71 minutes when Slimani made no mistake this time after getting on the end of an Iheanacho cross. United looked to hit back and created a chance as half-time substitute Luke Ayling - on for the injured Cameron Borthwick-Jackson - found Roofe with a cross, but the forward fluffed his opportunity from close range. It was then all over on 88 minutes when former Premier player of the year Riyad Mahrez ran at a back pedalling defence and planted his shot into the bottom corner of the net to make it 3-1. Leicester: Hamer, Iborra, Dragovic, Maguire, Chilwell, Albrighton (Mahrez 65), Amartey, King, Gray, Iheanacho (Vardy 81). Leeds: Wiedwald, Anita, Shaughnessy, Jansson, Borthwick-Jackson (Ayling 45), Roofe, Phillips (Vieira 72), Klich, Hernandez, Cibicki (Sacko 65), Grot.